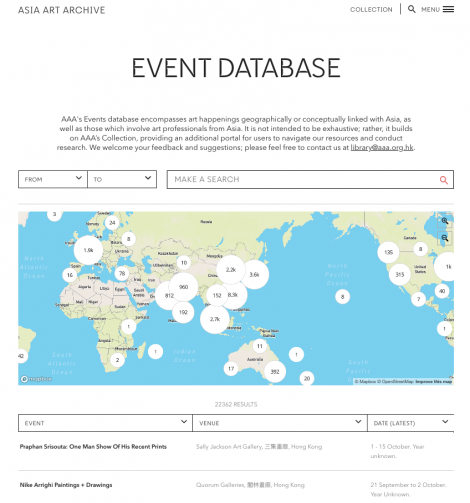 Keepthinking are very proud of the work that we have done for Asia Art Archive, and the website we launched with them in 2017. Work on phase 2 of their Qi and website commenced in 2018, including improvements, refinements and new features. One particular new feature was the incorporation of their very extensive event archive into their website. This took the form of an interactive map, with a search engine, as well as listings. This encompasses events that have been either geographically or conceptually linked with Asia. Other new features were changes to their collection search to further aid researchers (including the addition of citations, and pinning records into a basket for reference), a reorganisation of their programmes section, and a reimagining of their collection themes; as well as some exciting new features for their Qi.